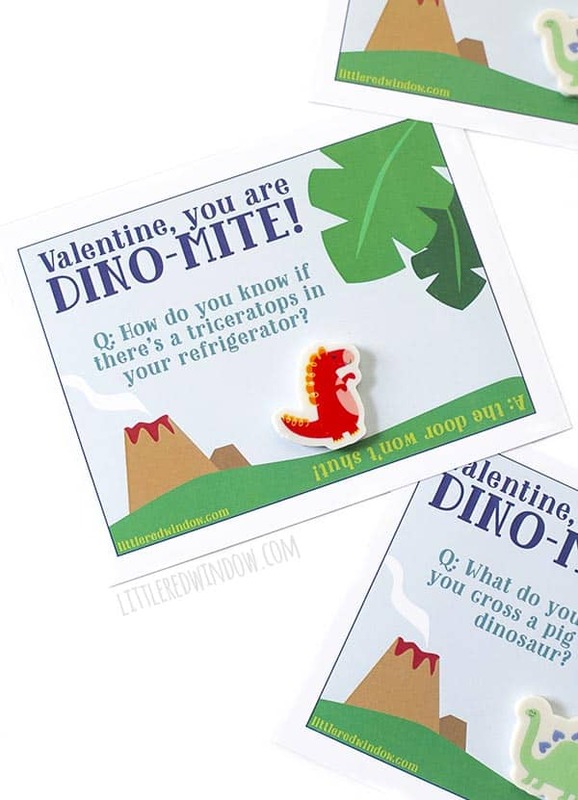 These cute free printable dinosaur valentines are super easy to print and cut and add a little dinosaur toy to and each one includes a hilarious dinosaur joke! 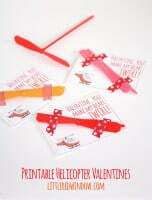 So what did I learn after making the EASIEST ever scratch off valentines last year with O? Elementary school kids love stupid jokes. Seriously. That’s all you really need once they can read, and they’ll be happy. At O’s school they don’t even have a Valentine’s Day party for the older grades anymore (that makes me so sad that he’s that old!) but they do still exchange cards. And when I picked him at the end of the day on Valentine’s Day last year, there were totally kids on the playground, scratching off their card and cracking up at the lame jokes. So I’m going all in on printable valentines cards with jokes for the precious few years of elementary we have left. And he’s definitely on board. Of course if I let him choose they jokes they would all be fart jokes. Don’t worry, I did not let him choose the jokes. 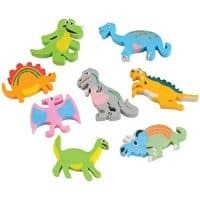 If you don’t want to do erasers you could do pins, stencils, little dinosaur figurines or even these cute little dinosaurs that you drop in water and watch grow! 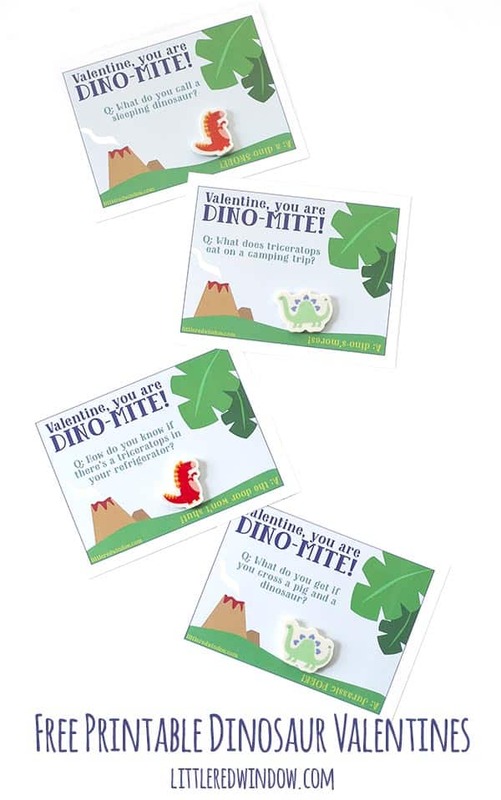 Print, cut and attach a little dinosaur to these adorable free printable dinosaur valentine with jokes! 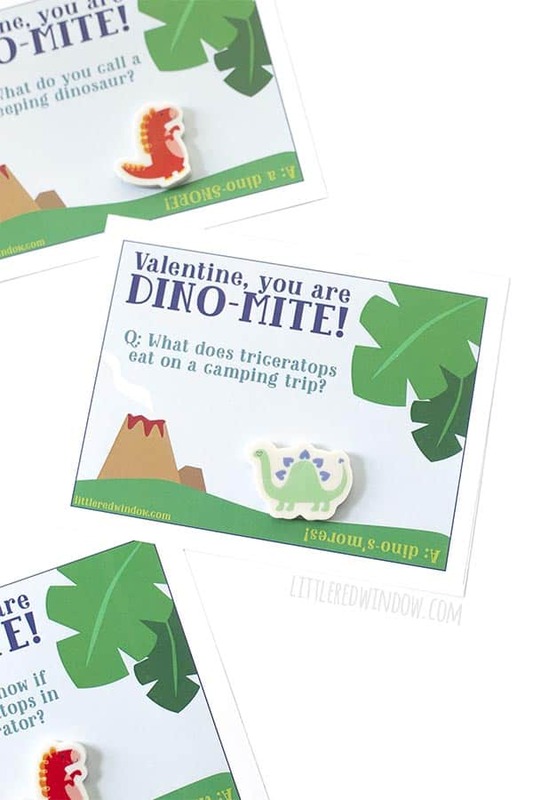 These Dinosaur Valentines are copyright 2019 Little Red Window Design and are intended for personal use only. 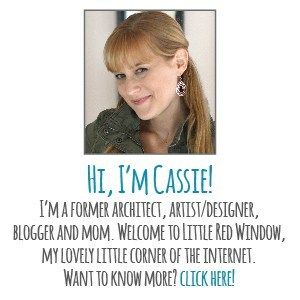 You may not distribute, sell, alter or share the pdf file either online or physically. 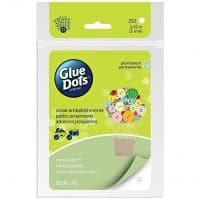 You also may not sell items made from this file. Please DO feel free to pin this project and send your friends here to download their own free copy!